The Howe Ridge Fire in Glacier National Park that destroyed a set of historic cabins over the weekend continues to grow. Wednesday night, an infrared flight measured the fire perimeter at 3,500 acres, a growth of roughly 900-acres from two days ago. “We did see an increase last night. 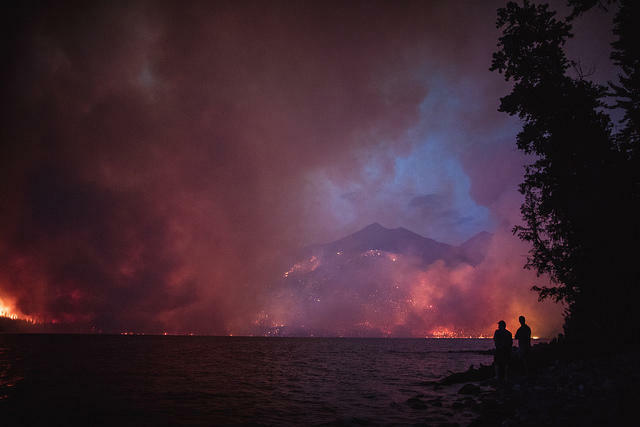 There was definitely active fire behaviour that went on well into the night,” says Diane Sine, a fire information officer with Glacier National Park. The 60-person Southwest Area Type 1 Incident Management Team, under the command of John Pierson, is onsite and will be taking over management of the fire at 6 a.m. Friday. Increased winds and lightning are in the weather forecast over the next few days in the area, which could result in the fire expanding even further. Area closures and evacuations remain in place for Avalanche and Sprague Campground, North Lake McDonald Road, and the Lake McDonald Lodge Complex. The Going-to-the-Sun Road is closed between the foot of Lake McDonald near Apgar Village and Logan Pass; it remains open from the top of Logan Pass toSt. Mary on the east side of the park. For much of the rest of Western Montana, a Red Flag warning for fire conditions will be in effect from noon to midnight Friday due to lightning storms and possible erratic wind gusts up to 40 miles per hour. The affected areas include Great Falls, Bozeman, Seeley Lake, Hamilton, Missoula, Butte, and Dillon. A hundred firefighters from states including Pennsylvania, Massachusetts and New Hampshire flew into Great Falls Thursday afternoon on a Large Transport 737 jet. Kathy Bushnell, a spokesperson for the Helena-Lewis and Clark National Forest was on the ground when the firefighters touched down. She says "they were excited to be here but also ready to get to work. They honestly got off the plane, got their gear, and their tools and got some food that we had, some lunches for them, and then they were going to head right to the fires." The five 20-person crews will be helping on the ground at three different fires in Montana: the 900-acre Sterling complex near Libby and the larger Goldstone and Wigwam fires in the Beaverhead/Deerlodge National Forest. Bushnell says it’s common for crews to get called into different states depending on need, but she said it’s less common to have so many firefighters arrive together at once. In fact, according to Bushnell, the last time this 737 - which is specifically contracted to transport fire crews - landed in Great Falls was 7 years ago. ​The 350-acre Shellrock Fire, burning 25-miles north of Helena continues burning in heavy timber and grass in steep remote country. The fire is primarily located in the Beartooth Wildlife Management Area and portions of private ranchlands. It's approximately five miles north of Beaver Creek Road, and two miles west of Middle Creek Lake. A high-voltage powerline and pipeline, along with two ranch cabins and a historic cabin are in the area, but not threatened at this time. If conditions are favorable and resources are in place, a planned burn out operation will be initiated Thursday. Fire resources will also continue to build and improve fire line, monitor for hot spots and mop-up where possible. Two 20-person hand crews have arrived to assist firefighting efforts. This update from the Helena-Lewis and Clark National Forest: The National Interagency Coordination has announced a Large Transport (737) jet lands in Great Falls this afternoon, bringing about 100 firefighters from out of state to help battle the many fires burning in Montana and Northern Idaho. This is the first time in about seven years that one of these jets, which is contracted specifically to transport crews, has landed in Great Falls. The Butte-Silver Bow Council of Commissioners approved a resolution Wednesday night to implement Stage I fire restrictions. Those restrictions go into effect at 12:01 Friday morning for Butte-Silver Bow. Stage 1 Fire Restrictions were recently adopted by the Dillon Area Restrictions and Closure Group of which Butte-Silver Bow is a participating member. The restrictions are a result of extended periods of hot, dry, and windy conditions coupled with low relative humidity and no considerable precipitation in the forecast. For additional information or questions call the Butte -Silver Bow Fire Department at (406) 497-6481. 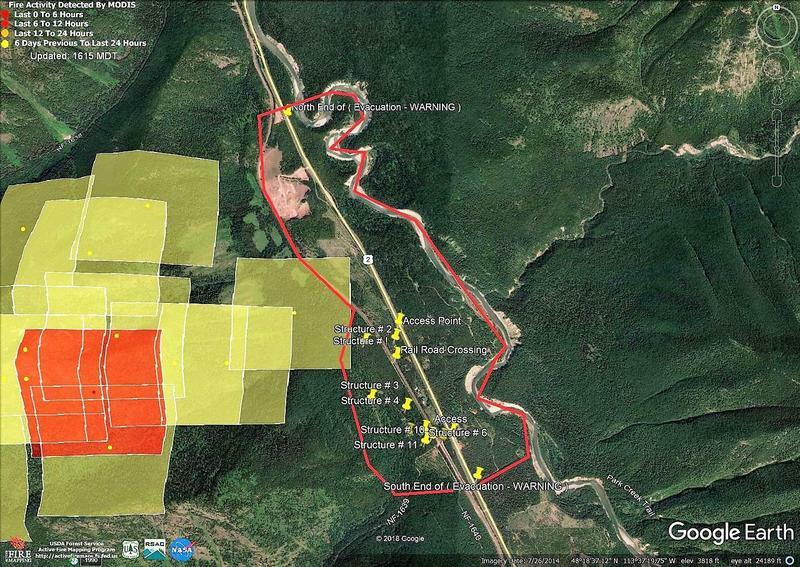 Howe Ridge Fire/West Glacier: Overnight infrared mapping measures the fire perimeter at 3,500-acres. 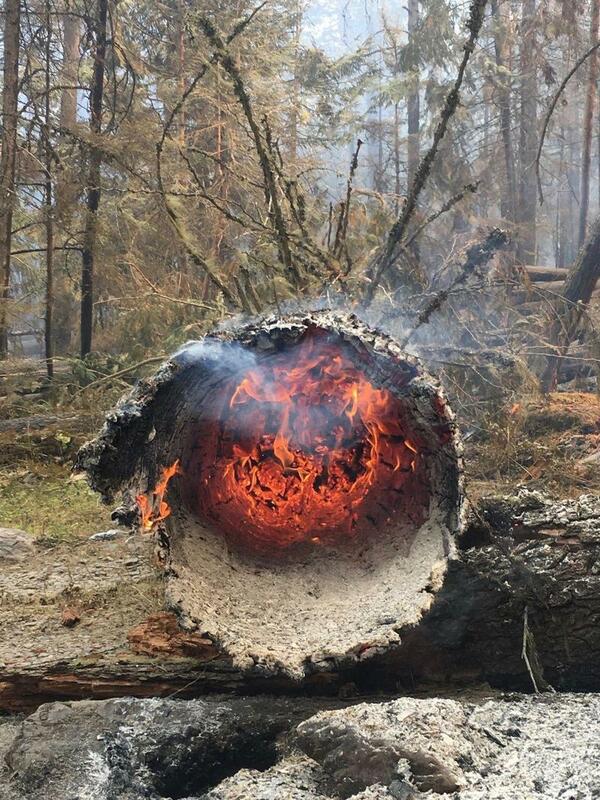 It burned actively through the night, with single tree torching and spotting in the southwest which led to a growth of roughly 900-acres since Monday. 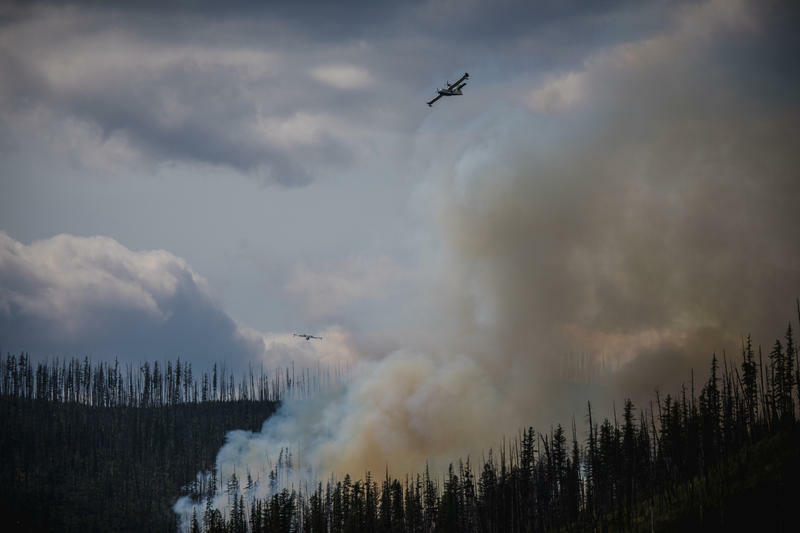 Additional spotting and growth were observed on the north edge of the fire on the southern slope of Mount Stanton, as well as the northwest edge of the fire toward Rogers Lake. Helicopters dropped water on the edges of the fire Wednesday afternoon and evening in order to slow fire growth. Due to favorable fire conditions Wednesday morning, evacuated landowners were permitted to access their properties. Some areas were deemed unsafe due to conditions and those landowners were not able to extensively access their property area, but were able to view it. Structural protection crews continued to work to reduce risk to buildings at the head of Lake McDonald and Kelly’s Camp. There are approximately 78 personnel assigned to the fire. Thursday's weather forecast anticipates the current high pressure ridge to begin breaking this afternoon, resulting in increased atmospheric instability. That means wind directions will likely change, resulting in potential for the fire to expand to the southwest and northeast. Thursday's firefighting efforts will include more structural protection. Ground crews will continue to establish a hose lay at the north end of Lake McDonald. Air support will continue to be used to control fire spread as conditions allow. The Southwest Area Type 1 Incident Management Team, under the command of John Pierson, is now onsite and will be taking over management of this fire at 6:00 Friday morning. Area closures and evacuations remain in place: · Avalanche Campground and Sprague Campground · North Lake McDonald Road (private residences and the Lake McDonald Ranger Station) · Lake McDonald Lodge Complex (all businesses, employees, and private residences). Private residences along the Going-to-the-Sun Road The Going-to-the-Sun Road remains open between St. Mary and Logan Pass. It is closed between the foot of Lake McDonald (near Apgar) and Logan Pass. Apgar Village, Apgar Campground and Fish Creek campground remain open. Most other areas of the park are open as well including hundreds of mile of trails. The Inside North Fork road is closed and multiple trail closures are associated with this fire. Please see full trail closures on the park’s website. The Logan Pass Star Party planned for September 7 remains scheduled. The Logan Pass Star Party previously scheduled for Friday, August 17 has been cancelled due to logistical considerations including west side access and visibility. The park has established a Fire Information Line at 406-888-7077. Glacier National Park and most of western Montana are under Stage II Fire Restrictions. No campfires will be permitted in Glacier’s frontcountry or backcountry. Smoking is also prohibited except within an enclosed building, vehicle, developed recreation area, or barren area three feet in diameter. Propane stoves that have an on/off switch are permitted. The 23-acre, lighting started Trail 467 Fire southeast of Lincoln, in the Poorman Creek area is now listed as 30-percent contained. A pre-evacuation notice remains in-place for residents in the McQuithy Gulch and Marsh Creek areas. Firefighting teams Wednesday worked hard to keep the fire within its current 30-acre footprint. Crews continued to construct and improve the fireline, mop-up the cooler areas, and monitor for spot fires, while the heavy equipment continued to create fuel breaks. A Type 1 helicopter worked the fire for about six hours, dropping about 1,000 gallons of water per drop to help cool the fireline. There is a fire weather watch for the area Thursday due to the potential for dry thunderstorms with gusty and erratic winds reaching the fire later tonight and into tomorrow. Firefighters will continue improving and securing segments of the fireline, mopping up, and monitoring for hot spots. The heavy equipment—skidgens and feller-bunchers—will continue to help reduce the number of hazard trees near the fire for firefighter safety. Helicopters will be available to assist today, unless the windy conditions prevent them from flying. Bighorn Fire: The Bighorn Fire is located in the Scapegoat Wilderness near Bighorn Lake and is about 3/4-acres. Firefighters have constructed fireline around the perimeter of this fire and will improve and secure that line to prepare for the incoming windy weather today. The fire is adjacent to a large patch of standing dead timber; so with the hot and dry weather expected to continue, the adjacent large dense dead timber stand. With the lack of available resources due to fire activity across the west, fire managers decided to suppress this fire rather than manage it within the Wilderness. On Tuesday morning the National Park Service confirmed that seven private residences, a number of outbuildings and several Park-owned historic structures were consumed when the lightning-ignited Howe Ridge Fire made a wind-fueled run Sunday night. The Flathead County Sheriff’s Office has issued an evacuation warning for a small number of residents near Essex just northwest of the Izaak Walton Inn along Highway 2 due to the Paola Ridge Fire. 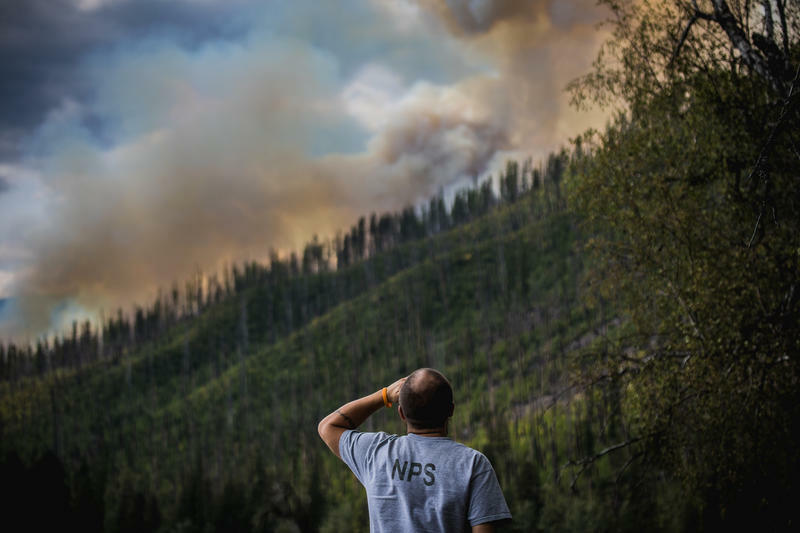 Eric Whitney: Nicky You're in West Glacier where the people were evacuated from the Howe Ridge Fire are getting new details about the fire and its impacts. Several of the cabins that made up Kelly’s Camp in Glacier National Park burned in the Howe Ridge Fire Sunday night. At a homeowners meeting yesterday, Park leaders spoke to families from the evacuation zone. Nobody expected the Howe Ridge Fire to get big. "What took place literally in less than 48 hours is remarkable," Park Superintendent Jeff Mow said.